Sometimes, you encounter something in Ubuntu that you'd like to change. Most of the time, you can do this by opening some sort of preferences menu and checking a few boxes. Other times, you might need to fire up dconf-editor or gconf-editor to manually modify keys in the dconf and gconf configuration databases. This works well and is relatively simple, but it's up to the developers what settings you can change this way. On other occasions, you may want to modify the program's source code instead. This may be because you want to make big changes such as adding or removing major features, or it may just be that a configuration parameter that you want to change has been hardcoded into the source [which is arguably bad design!]. One of the major advantages of open source software is that the source is open, so this is possible! It's also very straightforward, once you learn how. 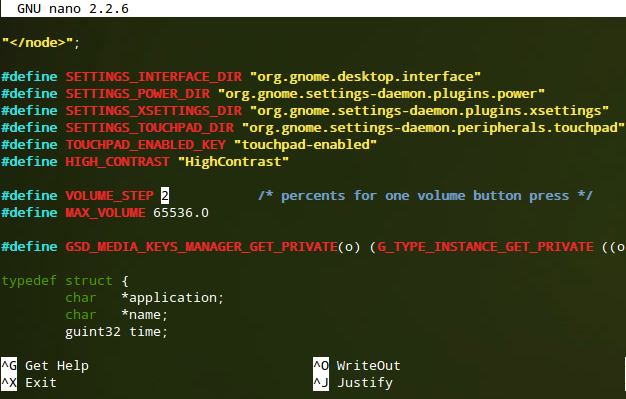 For this example, I'll be modifying 'gnome-settings-daemon'. By default, the system volume changes by 6% each time the 'volume up' and 'volume down' media keys on my keyboard are pressed. 6% is a pretty big jump, and it's easy to go from 'not quite loud enough' to 'way too loud' in a single button press. I'm constantly opening up the graphical slider to get the volume just right. This is extremely annoying, so I'm going to change it! Create a directory to hold the source code you'll be working on. Open up a terminal and change directory into the directory you just created. Success! Restart your computer and test out your changes.